"Hold fast to your dreams, for if dreams die life is a broken winged bird that cannot fly." Whether it's your home or your heart, send me an e-mail telling how you tackle clutter at your house, or how you ditch an attitude that prevents you from moving forward. I'll post entries in future updates to encourage each us. 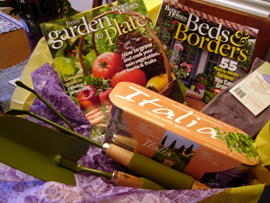 Box contains: from Garden to Plate book, Suede Cowhide gloves, Italian Herb window garden, Beds and Borders book, garden trowel & fork, and a 1 year subscription to your choice of Cooking Light, Taste of Home, or Mary Jane's Farm. The above is an excerpt from 100 Ways to Build Self-Esteem & Teach Values by Diana Loomans. To read the entire poem visit www.dianaloomans.com. I hope you find time to nurture your own creative spirit just like you would do for a child. Michele - I love the question you are asking. I've needed this prodding to put to paper my quest. I'm going to try very hard this year to have a respectable flower garden and I'm going to try my hand at a vegetable garden. Stefanie - I am really interested in cooking, so this year I want to try some new recipes, buy more cookbooks and get adventurous in the kitchen. 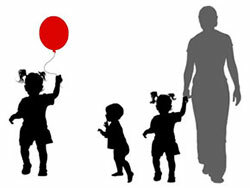 Kirsten - I have three children and I feel like I've lost myself in the shuffle of everyday life! I am passionate about creating beautiful jewelry. It is so soothing to sit and work quietly. I am resolving to spend a couple hours each week to take time for MYSELF to work on my craft! 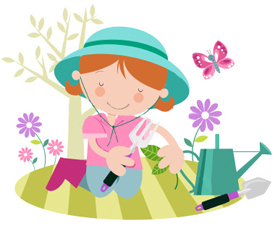 Laurel - I am going to start gardening again. I really enjoy it but have moved a couple of times in the past five years and have not done much. This winter I am going to plan my garden and get ready before spring comes. I have a big tree in the front yard that I can plant flowers around. That is my one step towards gardening again. If nothing else that is what I will plan on getting done this year. Maybe a couple of tomato plants on the deck and a few containers of flowers on the patio table. Did you know March 31 through May 6 is National Kite Month? I had never flown a kite and had always wanted to, so three years ago my husband bought us a kite and we went kite flying for the very first time. I had a few false starts but what fun when my kite took off and soared into the sky! Cut a kite shape out of colored paper. Attach yarn, jute, or twine to the bottom of your kite. Tie five strips of fabric or glue colored tissue to you string. Help your child write a poem about kites. Visit www.nationalkitemonth.org to find mazes, crossword puzzles, plans for a real kite, and much more. Is there something that holds you back from pursuing your creative goals? For every activity you give yourself to, you say no to something else. Whether it's the laundry, dishes, cleaning the garage, or some other activity vying for attention, the next time you have that desire to paint, design a necklace, or tend your garden, ask yourself these three questions. - Does that chore need to be done right this minute? - Would it be a crisis if that job waited for an hour? - Will it matter if it never gets done? computer, television, or anything that distracts. crave. It's a tough world out there to our children. boundaries. Enforce the rules, but don't be so rigid they can't have fun. If there's a punishment for breaking a rule - don't back down. They'll learn from the consequences and hopefully not make that mistake again. Mistakes will happen -never let them think you don't love them just because you're disappointed in what they did wrong. Praise them for what they do right. No matter what, love them! Dianne - The best advice I can give is to start chores early and it's definitely okay to reward them for the work. Teaching work ethics has to start early.